FIRST DAY OF PRACTICE AT PHILLIP ISLAND WITH THE MORNING SESSION THWARTED BY BAD WEATHER AND A VERY HEATED AFTERNOON SESSION. 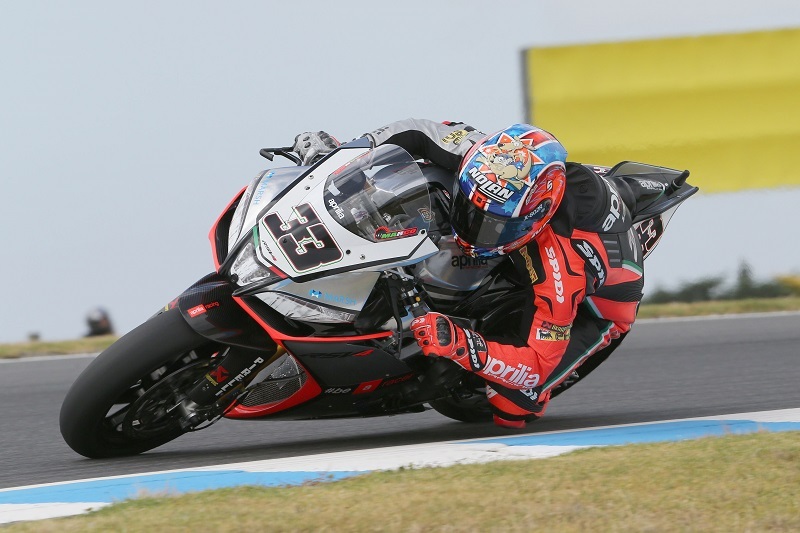 Phillip Island (Australia), 21 February 2014 – This is just the first day of practice in a World SBK championship that promises to be well balanced, long and exciting. But the Friday practice and qualifiers that were held on the magnificent Australian circuit at Phillip Island put the first rankings on the record. The Aprilia Racing Team took to the track for the first time with the RSV4 in its new silver livery which has already gained popularity with fans and the team. Melandri, in his first round with the Aprilia RSV4 reigning Manufacturer World Champion, put a nice second best time on the boards. After the first morning session that was basically abandoned due to the wet asphalt and changing weather conditions that hindered a decisive choice for bike setups, the games got underway in the afternoon session. Melandri lapped quite a bit (20 laps), working on various setups and trying several technical solutions in anticipation of Saturday’s Superpole and – above all – the races on Sunday. It was only in the last few minutes that he went out on the track with his sights set on a fast time and he hit the bullseye with a 1’31.137, just 37 thousandths of a second behind Lowes and ahead of Giugliano, Sykes, Rea and Laverty. The day didn’t go quite as well for Sylvain Guintoli, winner on this track at the world championship’s opening race last season. In the 16 laps he put in the best time the Frenchman put on the boards was 1,31.759 which relegates him to tenth place, although the gap is just 66 hundredths of a second from the leader. The French rider took advantage of the session to try out a few setup solutions on his RSV4, identifying the path he needs to follow in the weekend ahead. The small gaps (the top 11 are all within less than a second of one another) is indicative of just how well balanced this Superbike season is right from the start.